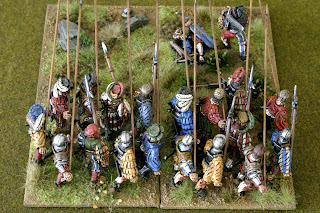 Basing Landsknechts is very much a matter for thought and composition as much as painting them is; the issues which struck me when dealing with them are how to get the best balance between being practical to game with and store along with visual impact and that overall feeling of your units looking realistic, the rear ranks being a tightly packed square and the attacking ranks a wall of steel with movement and menace. I have thought long and hard about how best to approach the matter and finally settled upon using 120 x 60mm rectangular MDF bases from those lovely chaps at warbases. 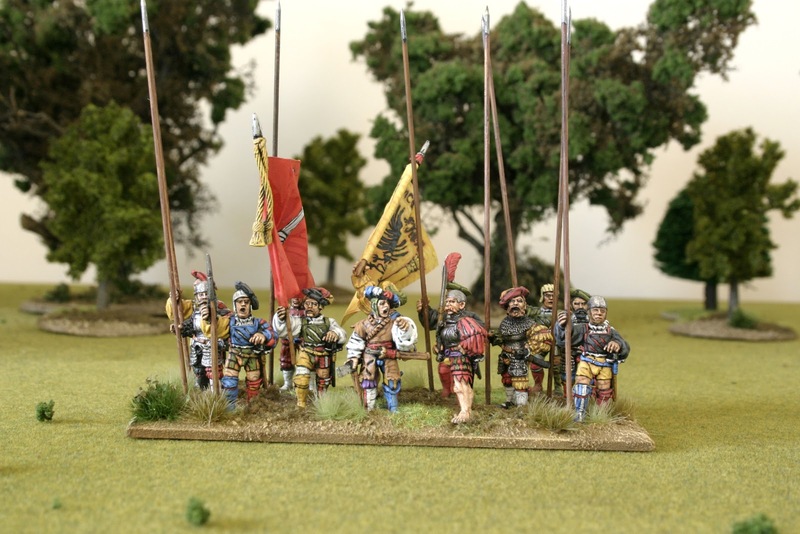 This way each base is a compact composition with its own command vignette and a wide frontage to display your best efforts. 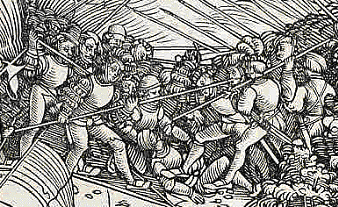 I suggest you use between 14 - 16 figures with a pike to halberd / blade ratio of about 1/4 this will give you a representation of around 400 men in real terms. 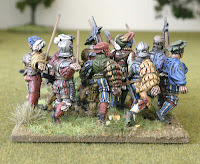 This style of basing really suits my preference to try and display as much as possible without obscuring figures whilst also still being practical . 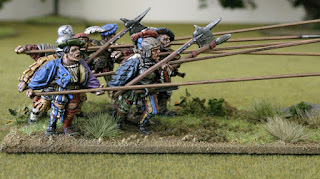 These pike squares look great on their own but you can use the same basing principle with the front ranks of attacking pike. 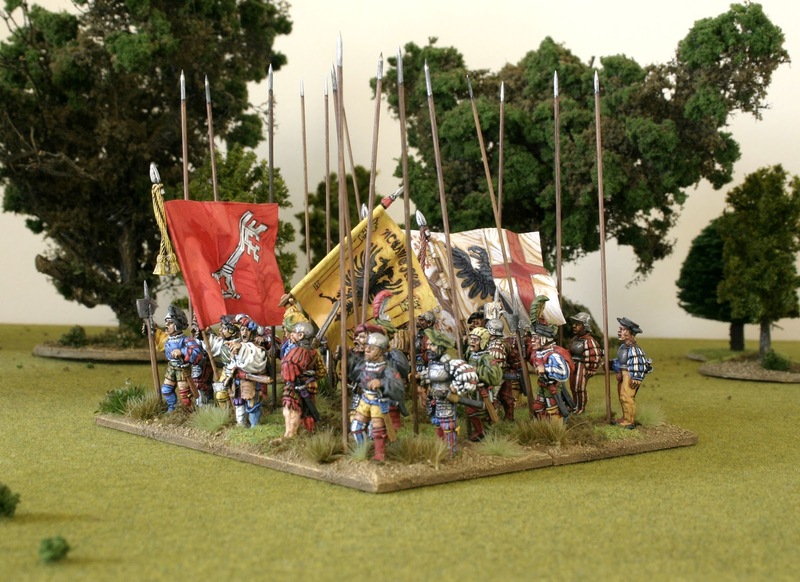 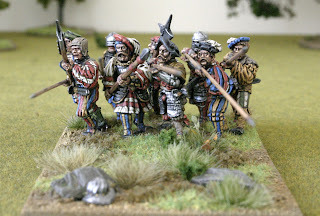 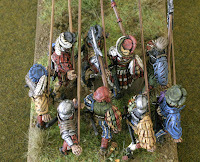 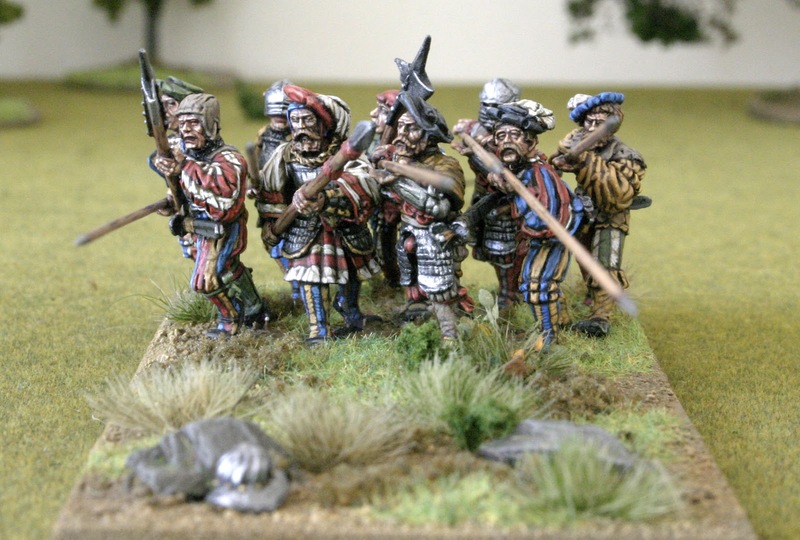 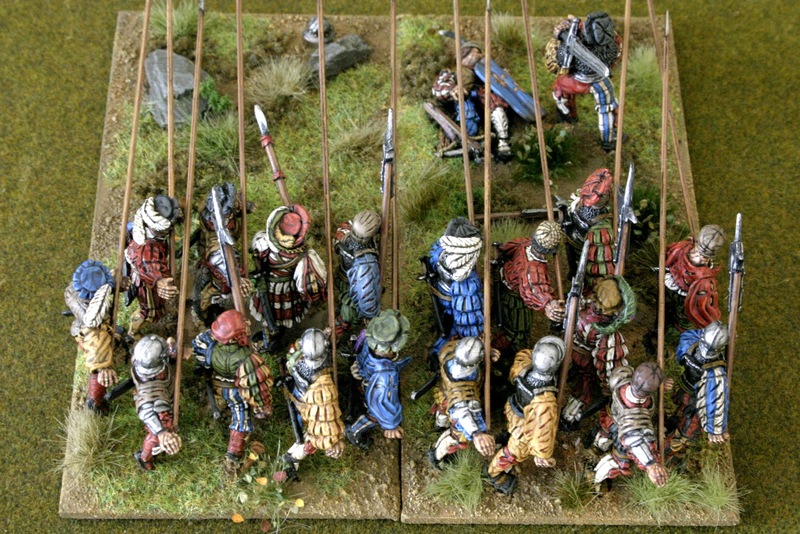 As with the standing units I have elected to base a double rank of Landsknechts with pikes at the ready on a 120 x 60mm base; this enables me to really pack them in tight to give a sense of the claustrophobic moment just prior to impact with pikes and halberds bristling. 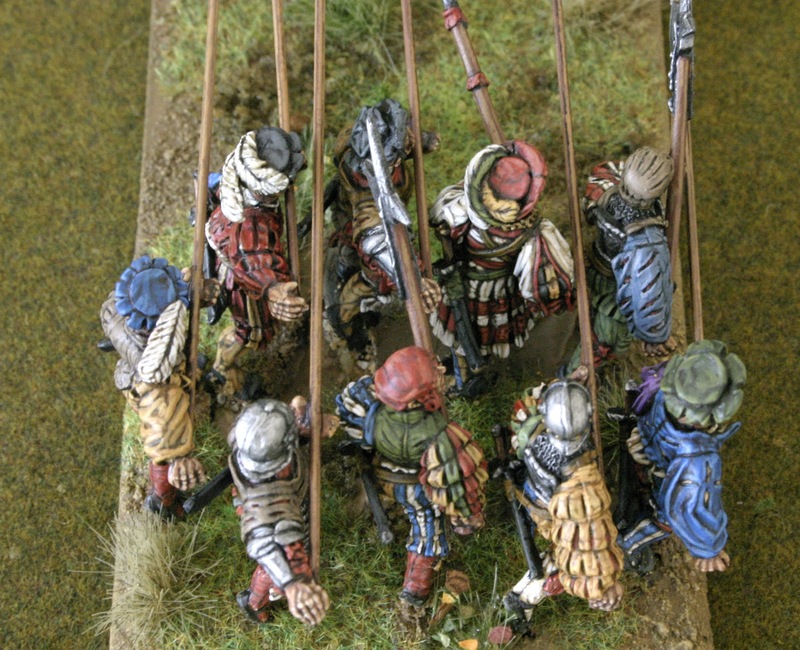 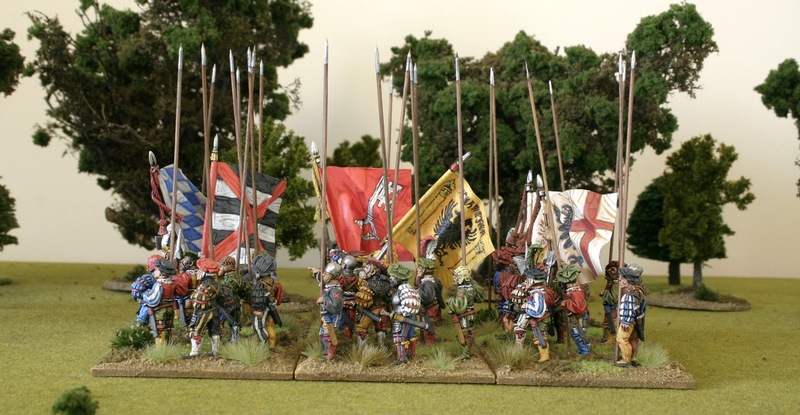 The long base also contains most of the length of the pike which makes for ease of storage, imaginative basing and minimises upon wargaming entanglement with other units. 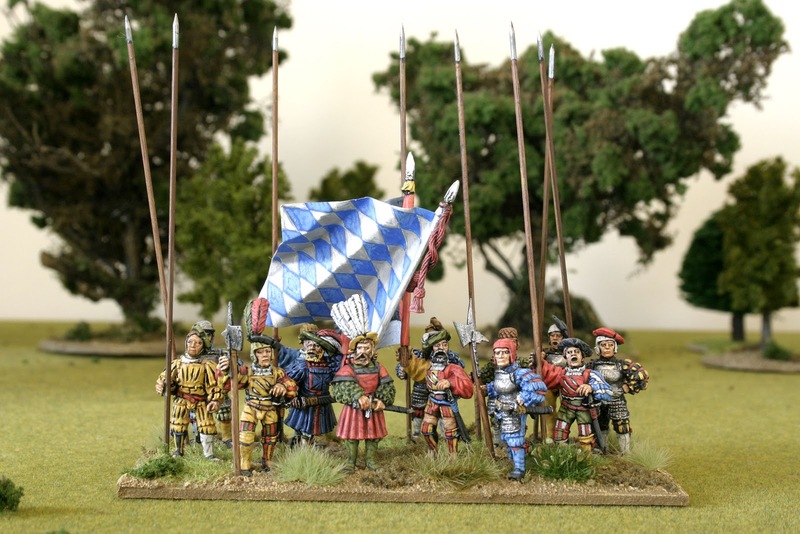 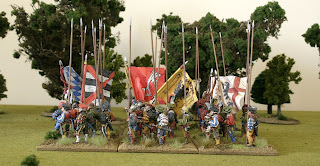 Here's the end effect, the banners of the Fahnlein are tightly ensconced within a protective wall of pike and you have a unit which is an impressive diorama.